Compiled and edited by Derek R. Mills, 1992. The Early History. Hall-i'th'-Wood stands in Tonge, formerly a small township of some eight hundred acres in extent, lying to the north-east of the centre of Bolton. The township's name has a number of possible historical origins, *1 all with similar meaning, a narrow strip or 'tongue' of land; the Old Norse 'tangi', Old English (Anglo-Saxon) 'tang' or 'tong' or possibly Anglo-Norman 'thwang'. Tonge runs north-south and is bound on the east by Bradshaw Brook, and the west by the River Tonge. The township was first mentioned in the early thirteen century for , in the reign of King John, a Gilbert de Tonge held one bovate of land of the king in Tonge for four shillings, *2 the family name having been derived from the township. (It is assumed that the family gave their name to the township of Tonge in the parish of Prestwich. *3 The family resided at Tonge Hall, Middleton, until about 1726, having been settled at Tonge, in Prestwich, since the close of the fourteenth century*4). Little is known of the Tonge family, of Tonge in Bolton, subsequent to the thirteenth century, except in 1332 certain prosperous "Boulton" citizens found themselves liable for tax, including "Johe de Thonge and Will de Thonge" . *7 It may be reasonably conjectured that the Tonge family built a dwelling somewhere in the township, near to the river, which could be easily defended. The site of the present Hall has been disguised from its original effectiveness as a defensible position; road construction, encroaching industrial and domestic buildings, and especially erosion by the river Tonge, which caused a massive land slip in Victorian times, have all made it difficult to visualise its original disposition . There would have been very few other sites in Tonge, if any, which afforded so much natural protection. Certainly, the Tonge family would have used such a site, perhaps their dwelling preceded the present structure. Other halls in Bolton, Little Bolton Hall (demolished about 1960), Great Lever Hall (demolished in 1907), and elsewhere in Lancashire had similar defensive sites, but that of Hall-i'th'-Wood was outstanding. *8 Mr. Irvine asserted "it cannot be that earlier owners of the Manor missed such a unique spot, and there can be no doubt that a dwelling has been on this site from remote ages." Included in the 1332 list of 'Boulton' citizens mentioned above was a "Nicho del Wode"; seven years earlier, on the 30th January 1325, "Thomas" son of "Nicholas del Wode" was fined 6d. for breach of the peace, and on the 19th October "Robert del Wode" was fined 4d. 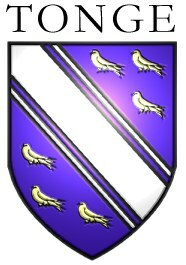 for unjustly withholding a debt against "Adam de Radeclif" *9 It would be convenient to assume that the Wode family lived in Tonge and were known by, or related to the Tonge family, but this cannot be substantiated. *3 Baines' History of Lancashire, vol. 1, p. 211 (1889 ed.). *4 Trans. Lancs. & Ches. Ant. Soc. vol. x. pp. 25-32. *5 1763 to 1807; whitster, and founder member of St. George's Church, now St. George's Craft Centre. *6 G. J. French; Life of Samuel Crompton, p. 29 et seq. *7 Rec. Soc. Lancs. & Ches., vol 31, p. 37 (latter). *8 Old Halls in Lancashire and Cheshire, pp. 71-73. *9 Rec. Soc. Lancs. & Ches., vol. 41. pp. 144, 160, 164.